It’s time to introduce you all to the concept of Guerrilla Dowsing. It was invented by my colleague Kal on your first visit to Stonehenge. He was a bit miffed by the fact that we had travelled a long way to visit the site and it was all cordoned off. You couldn’t get within two hundred feet of the actual stones, unless you had made a prior arrangement to visit after normal visiting hours. Well, we were only down for the day and hadn’t made such arrangements. Consequently, Kal was all for jumping over the low cable strung around the edge of the site and dowsing until he was forcibly ejected. It was only my protestation that made him reconsider. On reflection I wish I had not said anything. We should have just done it, but I am a bit less gung-ho than Kal when it comes to breaking the rules. That’s a lifetime of English culture bearing down on me, I suppose. 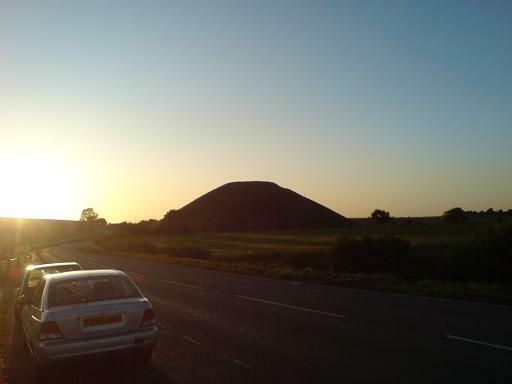 But tonight I was heading across country with two purposes in mind: firstly I wanted to confirm my findings at West Kennet, and secondly, I was just going to climb Silbury Hill and dowse on top of it – to hell with the consequences. And so I did just that, and I’m glad I did. Barbed wire or no barbed wire I wasn’t going to be denied “my heritage”, especially not now that I have found the Way of the Druid. Silbury Hill was made for people like me, by people like me, and is NOT the preserve of some archaeological unit. For some reason English Heritage have not seen fit to re-open the site despite stabilisation work started in 2007 that was due to be completed in Spring 2008. It’s late Summer 2009 and the site remains closed off to the public. For our own safety and the preservation of the site, of course. It was a very steep slimp up the 51 degree slope. Apparently this angle is the same angle that the Great Pyramid of Giza shares with Silbury. Perhaps the designers conferred before construction, or maybe they got the same guys in to design it? 😉 I followed a well-trodden path up the ‘back’ slope away from the lights from passing traffic on the A4. After a few minutes of excited but exhausting climb the slope levelled out briefly before descending into the circular depression that had presumably been repaired. I trod carefully watching out for potholes or sinking chalk, but the ground was stable. Perhaps it would be less stable if we had rains like those of 2002 when the site was closed off? It was a beautiful night atop the hill and despite the darkness the view was stunning – twinkles of lights in the distance all around and the occasional sweep of car headlights rearing over The Sanctuary and then passing behind me. Above me was the celestial majesty of a curtain of stars laid out all around. Directly above me was The Milky Way, and I haven’t seen it so clearly since I went up onto Moel-Ty-Uchaf stone circle above Llandrillo in North Wales last year. It seemed to me that the centre of the Milky Way was directly above me and craning my head back made me want to sit down to get an easier view. I vouched to do that in a minute or two. Firstly I soaked up the atmosphere a bit more. A slight breeze was blowing, just enough so that you would know you were on top of a hill, exposed, but ducking down into the hollow immediately engendered an almost complete silence – not a breath of wind was felt. I marvelled at how I could see so clearly and looked up to the east to see a quarter moon bathing the hill in moonlight. I was quite incredible how the hilltop caught the light like I was on stage or something. Time to dowse, I felt, before I did a bit of meditating. I picked up my dowsing rods and walked to the edge of the hollow area, edging towards the steep slope from which I had come up. From there I asked to find my power centre, and was led back to the hollow, but instead of going into it I began to circle around it, widdershins (i.e. anti-clockwise). I traced a path around the edge of the hollow, and then began to spiral inside the hollow ridge. I must have circled around some six or seven times before eventually reaching the spot near to the centre of the hollow – right where I had first sat! I looked around – yes, I had managed to put my bag right on the power centre in the absolute middle of the hollow without realising it (because initially I had no idea how far the hollow extended when I put it down). Another startling coincidence in a long catalogue of such things. I dowsed to find out which energies were present at this power centre and got reactions for male, female AND neutral. 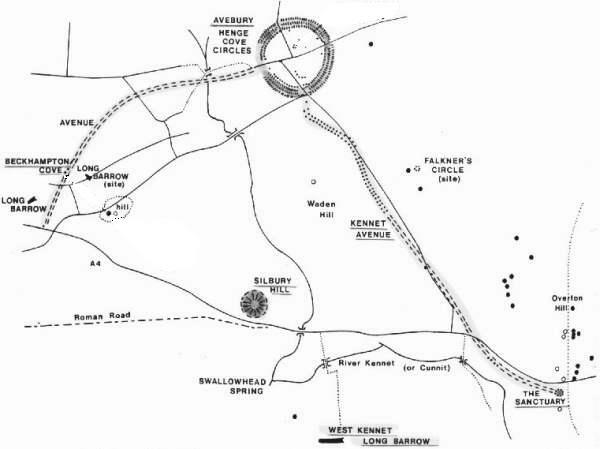 So, it would seem that I was situated on a ley line linking with other nearby sites (not surprising considering where I was, close to Avebury, The Sanctuary and West Kennet). The combination of male and female energies also meant (to me) that I was on what we call a “white stream” – a very positive energy centre. It certainly felt strong – streams of energy could be felt rising out of it if one quitened down and tuned in keenly to the body’s sensations. I wanted to dowse one more thing before I stopped – what could the purpose of this hill be? This is a altogether trickier thing to dowse for, and usually involved a combination of educated guessing and listing things that have previously given a response at other sites, as well as some creative questioning. “Proper” dowsers would be abhorred by this, I’m sure. Scientists would wet themselves laughing, but I have found that some sense can be gained if one tries hard enough. The technique I use is to quiten down the mind and allow the genius loci of the site to speak for itself. Sometimes a response can be heard, or a thought pops into your mind that you wonder where it came from. That’s often a good starting point for investigation and confirmation with the rods. I did this, and the thought arose that the combination of energies at a single point was significant, as was the structure of the mound itself – the shape rising to a pyramidal point suggested the concept of “focus”. I heard myself repeating this word, so began to ask questions about the concept of Silbury being a focal point. Soon enough I hit upon positive responses, and finally I concluded that the best guess I could make with the rods was that it was a central point in the surrounding complex of sites, and the hill shape was constructed to be the focal point for all the energies travelling through it from connected sites. The question of why this should be so is much more difficult to get at and will require further visits, I feel. I felt completely validated by this! It was a wonderful moment. Until I visited the hill I hadn’t really considered how it fitted into the overall scheme of things because I couldn’t get to it to dowse it and verify things for myself. Now I knew that my idea wasn’t an isolated crazy notion. Someone else shared my madness, even if Devereux would be horrified by the flakiness of the energy dowsing that he seems to despise so. We had got to the same point by similar means – allowing the hill to speak for itself. Back to the action. After my connection with the spirit of Silbury (however fleeting or superficial that was) I decided to sit back and admire the Milky Way and Moon combination that was hovering in the sky around me. I propped myself up on my backpack and sat looking directly up into the heart of the Milky Way. After a few minutes I began to drift into the core of the galaxy, my mind travelling further and further into the dark heart of the universe. Then the Milky Way began to slowly churn around, lazily drifting clockwise around me as I ascended into it. This effect got stronger and faster the longer I held my gaze and suddenly I became cautious and awareness of what was happening dawned on me. As it did so I managed to pull myself free by seeing the periphery of my vision again, unfocusing from the centre. I had known I needed to re-engage with the earth because I was beginning to get physical sensations of nausea accompanying the ‘journey’ and it momentarily made me aware of my body again. I knew this sensation – it was dizziness! My eyes tried to hold onto something nearby, but I was spinning as though I had spun around twenty times! I stood up and fell over again immediately. Wow! What the hell…? I had to roll myself away from the power centre quickly, I knew that. I crawled on my hands and knees to the rim of the sunken area and grabbed onto a clump of vegetation to steady myself. The feeling passed after a few moments anchored to the rim of the hill. I stared at the power centre where I could make out the shape of my bag in the moonlight, trying to take this in. Sitting and letting my mind wander on that power centre had been a trip and a half! Such an upsurge of energy! Now I was in no doubt at all – this place certainly was a focal point for energy and I had been foolish enough to let myself swim in its effects for a few moments, and was nearly swept away! 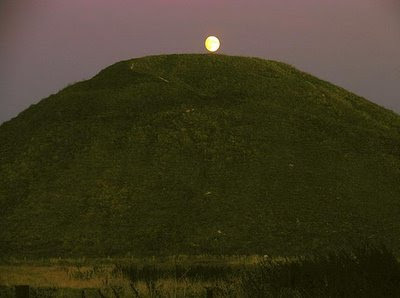 This left me in no doubt – Silbury Hill forms a powerful link with other sites, and is a focal point for all three forms of energy (male, female and neutral) to combine with immense force. I felt that I had to reclaim the use of this site for energetic experimentation. It’s incredibly and indescribably strong and full of potential for shamanic uses. I for one will return again another day or night to work with these energies again. Positioned on a point of power.